Founded by Hermann Muthesius in 1907, the aim of the Deutscher Werkbund was to foster links between artists and German industrialists to develop a German identity through design and architecture. By 1914 there were 1,870 members in 6 countries. The Werkbund expanded on the English Arts and Crafts movement, adopting concerns that craft and design influenced people’s lives and propagating a rejection of historicism in favour of vernacular architecture suited to the modern age. The major difference between the Arts and Crafts movement and the Deutscher Werkbund was that the Werkbund sought to combine promotion of craft with industry, as opposed to a rejection of machine production. The Werkbund embraced technology to design objects and buildings that fulfilled the changing needs of society. ‘Between 1894 and 1904 the value of Germany’s foreign trade doubled, and by 1913 Germany overtook Great Britain in percentage of world production.’ Industry was vital to the German economy, and as they had no access to cheap materials, the focus was directed towards high quality craft production. In contrast to British Arts and Crafts ideals, architects in Germany started to see mechanisation as necessary, and therefore needed expression through architecture and design. Muthesius was interested in exploring nationality, and seeking to ‘express architectonically the dignity and calm endeavour of a new, confident national German spirit.’ Some Werkbund architects including Walter Gropius were involved in plans for social housing, developing notions of standardisation and prefabrication. For the most part however, the focus was on industrial production. Figure 1. AEG Turbine Hall, Peter Behrens, 1908-09, Berlin, Germany. Credit: rucativava. Source: wikimedia commons. Accessed 24 November 2015. Peter Behrens epitomises the Werkbund’s preoccupations with representing industry as both noble and part of German identity. Behrens successfully formed a corporate identity for the electrical company ‘Allgemeine Elektricitäts-Gesellschaft’ (AEG), through graphic design, advertising, products and also architecture. 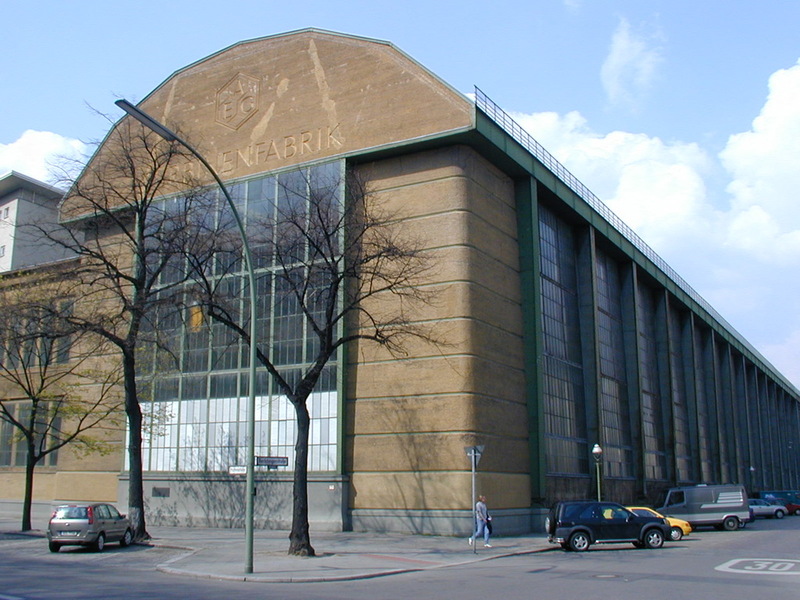 The AEG Turbine Hall (1908-09) [Fig.1] was built as a factory and needed a central hall without interruption facilitating the movement of large turbines within the space. A steel frame was therefore used, and is exposed on the exterior combined with heavy masonry massing. However, in details Behrens exposes the masonry as structurally unnecessary; the corners are huge but the horizontal bands and the overhanging roof proves that they have no load-bearing function. He is reversing our expectations of lightness and mass. Similarly on the sides of the building, stanchions taper and finish resting on giant hinges. [Fig.2] This is an exercise in embracing the possibilities of new technology. Figure 2. 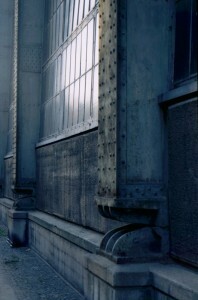 Stanchions detail, AEG Turbine Hall, Peter Behrens, 1908-09, Berlin, Germany. Credit: Andrew Carr. Source: flickr. Accessed 24 November 2015. The building is also concerned with endowing industry with gravity through monumentality. As industrialisation was seen as vital to the future of Germany, this building is giving form to the new German culture. The influence of classical language is seen echoing trabeated architecture, using stanchions instead of columns. Behrens’ evocation of nobility through abstracted classical form has led numerous scholars to describe the Turbine Hall as a temple dedicated to industry. The 1914 Werkbund Exhibition in Cologne showed the split between Expressionistic forms and ideas of rationalism within the group, see also Glass. Debates between Henry van der Velde and Muthesius about the future of the movement led to the weakening of the Werkbund, and after World War One the group lost influence. The Deutscher Werkbund was an incredibly important and influential movement; the idea that architects and designers could be part of mass production and industrial design continued to develop in Germany with the Bauhaus movement and Werkbund architect Walter Gropius. Erik Ghenoiu, ‘Post Industrial Spaces of production: The New Brooklyn Economy and the Deutsche Werkbund,’ in The Architecture of Industry, ed. Mathew Aitchison (Farnham, Surrey, England ; Burlington, VT, USA : Ashgate, 2014), 19. Frank Ching, Mark M. Jarzombek and Vikramaditya Prakash, A Global History of Architecture (Hoboken, NJ: Wiley,2007), 703. William Curtis, Modern Architecture Since 1900 (Oxford: Phaidon, 1982), 100. Ghenoiu, ‘Post Industrial Spaces’, 26.